Fig. 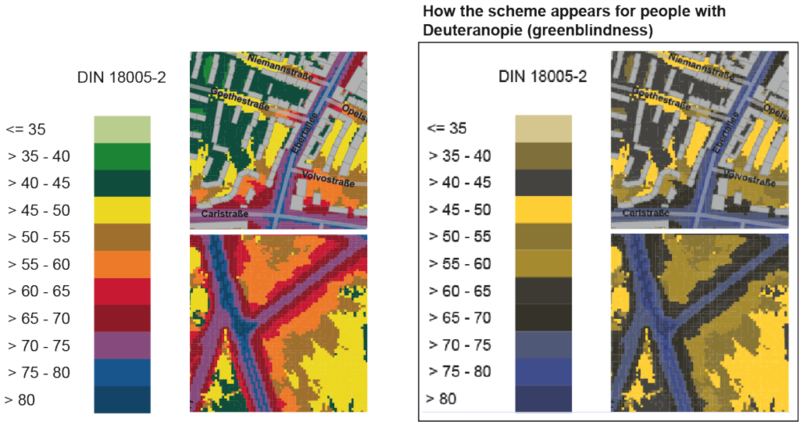 1: The scheme according to DIN 18005-2:1991 is based on an out-dated specification in ISO 1996-2:1987 (1996) and is a requirement for German noise maps according to German law. However, similar schemes are also used by other European states (Data source: anonymized data set „Silent City“ by Lärmkontor GmbH). The colors cannot be ordered according to lightness and thus cannot be matched to the dB-values. There are big steps in saturation between the individual colors, which further counteracts the potential to bring the colors in a perceptive order. Colors cannot be associated with the characteristic of the dB-values. Although the scheme is inspired by a traffic light system and uses green for lower values, the signal color red is used in the middle of the scheme, thus highlighting this sequence more than the higher, harmful values. These harmful values are presented in light blue, which is counterintuitive. Red and green are used in combination, which hinders readability for users with color vision deficiencies. Thus, this scheme is not suitable for presenting ordered values such as dB-values. I therefore suggest an alternative scheme. Copyright © 2019 Coloring Noise. Bereitgestellt von WordPress. Theme: Spacious von ThemeGrill.